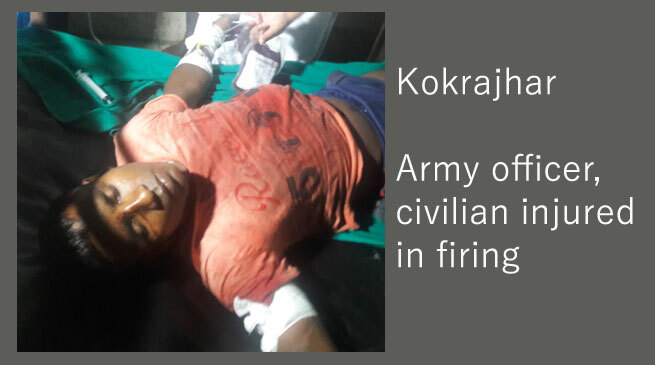 An army captain and a civilian were injured in exchange of fire between the army and suspected militants at Raimona Auxiguri under Gossaigaon police station in Kokrajhar district Thursday late evening. According to police source, there was a firing incident in Oxiguri /Raimona area at about 8.30 PM in which one Army officer and one person have been injured in the gunfire. The army officer was identified as Captain Trepatpreet Singh who received a bullet injury in his arm while the civilian was identified as Rufan Tigga. Rufan Tigga was seriously injured with three bullets injuries including chests, shoulder and right hand. They have been evacuated to RNB Civil Hospital, Kokrajhar. The army officer was later taken to the army hospital in Guwahati. The civilian was taken to Barpeta Medical College. Rajen Singh SP Kokrajhar said that last night at Raimona Axiguri village under Gosasigaon subdivision Kokrajhar firing was held. One army captain and one civilian got injuries, both the injuries were evacuated to Kokrajhar Rupnath Brahma civil hospital and later referred to Barpeta and Guwahati GMC hospital for further treatment. Singh also said that the investigation has been going on regarding axiguri village incident.